Like sibling rivals Australia and New Zealand vie for bragging rights and international attention. The older sibling, Australia has twelve alpine ski resorts that dot the Great Dividing Range offering great family skiing on mild terrain. Younger and more wild, New Zealand offers more challenging terrain and free spirit riding. Due to low elevations and warm weather, many of Australia’s mountains focus on beginning skiers and rely heavily on snowmaking. Australia’s most northern resort, Selwyn Snowfields, as well as Victoria’s Mt. Baw Baw and Mt. Buffalo provide great beginner and intermediate terrain, catering to commuter families with cheaper lift tickets; lift served toboggan and tubing parks; and cross country trails. Mt. Buffalo brags that by the end of the day the lifties running their five lifts will probably know you by name, and blatantly recommend extreme skiers ride elsewhere. 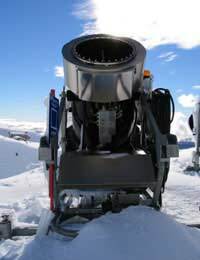 Eighty percent snowmaking covers Selwyn Snowfields keeping the mountain open all season despite nature. On the NSW/Victoria boarder, Thredbo claims the longest run (5.5m cat track style) and mutually exclusive longest vertical drop (672m). Three hundred eighty guns spew manmade snow over lower elevation portions of the mountain allowing intermediate top to bottom skiing most of the season. Snowbound Charlotte Pass’s in New South Wales allows a maximum of 600 skiers on the 90% beginner and intermediate terrain served by five lifts. Australia’s oldest and highest ski resort boast feels like a private resort with public access. The village’s European atmosphere provides destination services including Après ski, as opposed to commuter ski areas like Selwyn Snowfields. Opposite Charlotte Pass is Perisher Blue the largest ski area in Australia with 1245 hectares of skiable terrain, 50 lifts servicing seven peaks and a 420m vertical drop. Like most major resorts Perisher blue and Mt. Buller, smaller but more popular, offer on snow accommodations, night skiing, cross-country trails and a snowboard terrain park. Mt. Buller relies more on snowmaking to maintain snowpack all season, while Perisher Blue’s season length is at the mercy of nature. Mt. Buller’s Urbanized base village, 700m vertical drop, 180ha of skiable terrain, and Bourke St beginner area, the busiest ski run in Australia, make Mt. Buller popular and crowded. With 30% and 18% advance runs at Mt. Buller and Perisher Blue respectively, advanced skiers prefer Hotham ski area’s 80% statistic. Most Hotham skiers stay at Dinner Plain but the area’s recent village improvements, 245ha of skiable terrain and helicopter access to Falls Creek, a resort with a snow guarantee, increases its appeal. Falls Creek charms all levels of skiers and snowboarders with unexplored lift served back bowls, cat skiing, terrain parks and huge half pipes, while maintaining a small mountain feel. Tasmanian skiers play like no others in Ben Lomond and Mount Field National Parks. Not like traditional destination resorts with urban comforts, Southern Tasmanian Ski Association operates the four surface lifts at Mt. Mawson, Australia’s southern most ski area. Consistent snowfall and community operated make Mt. Mawson more like a YMCA than ski resort. Ben Lomond, considered Tasmania’s premier ski resort, provides alpine fun in a simple manner with an alpine village located at the base of the six surface lifts. Skiers and snowboarders must purchase national park entry passes as well as lift tickets, which support ski patrol and area development projects. New Zealand’s 22 commercial ski areas; 9 ski clubs with their own private resorts and guides; and 45 helicopter and snowcat guided backcountry skiing operations, offer steeper, more challenging terrain for expert skiers and snowboarders. Cold, powder-producing storms traditionally hit New Zealand in July and August, while warmer spring conditions abound from mid-September to the end of the season in October on the North Island or until November on the South Island. However, Mt Hutt, located in the Canterbury region, often opens in mid to late May. Wide-open treeless slopes mixed with undefined terrain and marked trails define New Zealand skiing. With very few on-hill accommodations après-ski happens at nearby cities. With views of the South Pacific, the outdoor culture permits exploration with limited rules or protection, but commercial skiing offers many traditional resort benefits including lighted night skiing, snow-sports school, restaurants, retail, and equipment rental and repair. The Super Pass allows coupon holders to ski or ride New Zealand’s three premier ski areas, Coronet Peak. The Remarkables and Mt Hutt. The older more responsible sibling, Australia provides beginner terrain, great for learning, and snowbound resorts with private or European resort ambiance. However, lower elevations and coastal snowpack make wet and manmade conditions common. The younger wilder sibling, New Zealand’s extreme reputation and numerous guide companies provide various steep and challenging terrain and non-traditional mountain skiing adventures, while commercial resorts serve all level of skiers and adventurers.